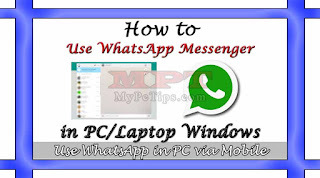 This article is about using WhatsApp Messenger via PC or Laptop because this feature is officially released by WhatsApp itself and no third party application or script required for performing this tutorial. You have to just ensure that you are fulfilling below given requirements. WhatsApp this feature is very unique one and you can use WhatsApp on your Laptop or Desktop PC's Windows without using Log in ID or Password, you have to just take Phone near Screen of Laptop/LCD to scan the code which will automatically log in your WhatsApp account in prescribed platform and you will be able to send and receive messages, voice notes, media on your Windows but don't worry all messages will still remain on your Phone including media files. 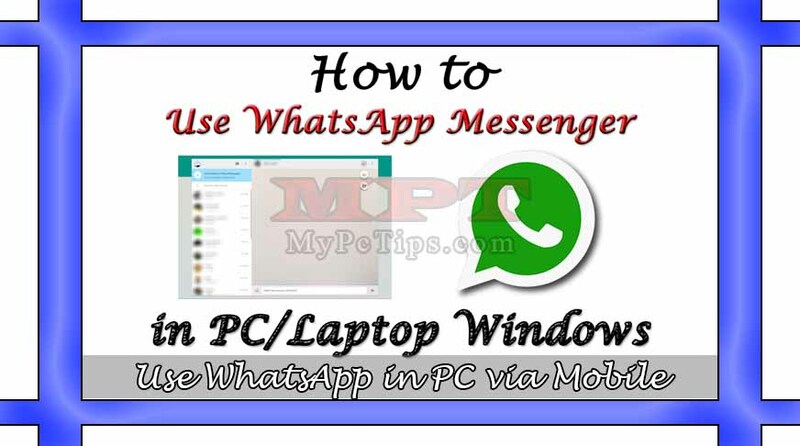 This feature is very useful, you can plug your phone to charge and sit on PC and log in your WhatsApp on PC so that you can use WhatsApp at the same time while your mobile is being charged. Its really great work and good feature of WhatsApp. Desktop PC/Laptop with Internet Connection. Any of Following Mobile Phone with Latest version of WhatsApp and Internet Connection/Wifi. Take your Phone, Open WhatsApp and Go to Option Menu in your Phone and Select "WHATSAPP WEB". Bring your Phone near Laptop or LCD Monitor Screen to "SCAN QR CODE". After 2 or 3 seconds it will automatically connect and your will see WhatsApp contacts and messages in your Laptop or LCD Screen. That's it and it is really easily but great feature to use WhatsApp. Note: 1st and 2nd Steps performs in PC/Laptop while 3rd and 4th with Mobile Phone.